Finding a home on the lake is an exciting time; so exciting that one may forget to check a few important aspects out before signing the paperwork. This list will help you remember the main focuses on purchasing your new lake home other than what you plan to do once it is purchased. Number 1: Find an agent that is a waterfront specialist. Typical agents will not have the knowledge of every aspect of purchasing and owning a waterfront property. They may have enough to complete a sale, but there is more to it than just pointing then signing. For example, one home may be cheaper due the fact that its lot doesn’t have year round water. It is important to find an agent that knows the ins and outs of your lake. They will ensure that the home you purchase is perfect for your needs. Number 2: The property is more than just a home. You must remember that you are not just looking at the home itself, but you need to take a look at the property, the views, and other aspects of living in this specific location. Often times a rambunctious home buyer will buy a home that they fell in love with only to find that the view is bad, the swimming is actually mucky, and other problems they could have avoided. Number 3: Choose your home to fit your lifestyle, not build your lifestyle around the home. The home may be absolutely perfect, but it may not be perfect for you. If you love kayaking on calm waters, a house on a busy main channel is probably not for you. You will need to think of key aspects of your life that you would like you home to cater too. After all, you are spending good money on it, so make sure that it fits your lifestyle instead of the other way around. Number 4: Get to know the neighbors. It is crucial not to be shy. Go ahead and knock on the doors of the neighbors. They have insider information about the area and other aspects of living in the neighborhood. You do not want to purchase a home only to find out that at night it turns into a loud party area. No matter what state you are looking for property in, this list applies to them all. Keep your list of personal requirements near by as you look at homes. Do not let your excitement blind from all aspects of the decision making process when it comes time to purchase your home. 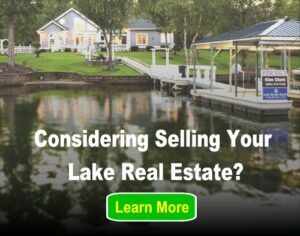 Lakefront Property: What Are Your Options When Buying at the Lake? Thanks for pointing out that when you are considering buying a waterfront home you should not just look at the house but also the property, the views, and other aspects of the location. My husband and I are looking for waterfront homes for sale because we think it would be perfect for our active lifestyle. I also think that it would just be so peaceful to be able to live in a place where you can always hear and see the water.